Now that it is heating up here in Utah, it is time for more outdoor cooking. John cooked the chicken thighs on the grill painting them with barbecue sauce on the last turn. This way the skin gets crispy and the sauce caramelized without the whole thing catching on fire. In the mean time I sautéed onions, mushroom, and garlic. I added a little liquid and the zucchini for the last five minutes. The couscous was cooked with some green onions and dressed with olive oil. 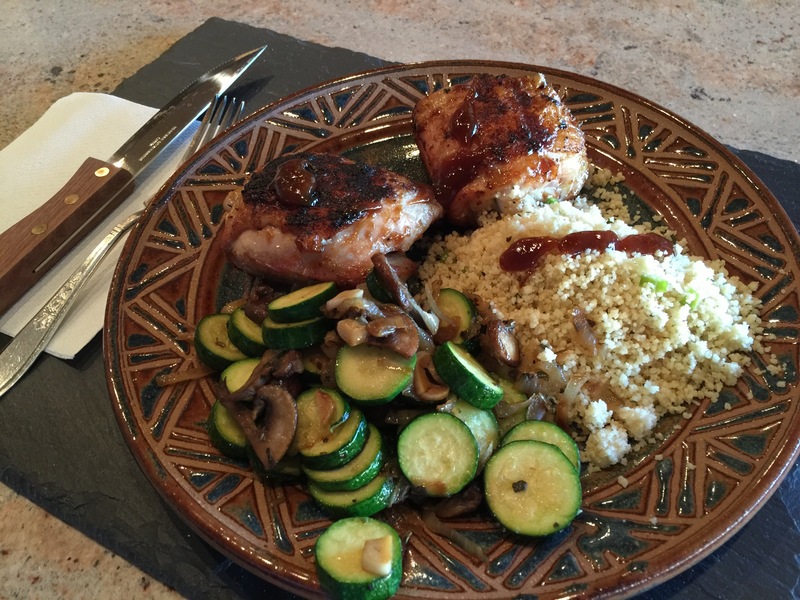 This entry was posted in Poultry, Vegetables and tagged chicken, chicken thighs, couscous, mushrooms, Onions, zucchini. Bookmark the permalink.